For those that don't know, Highbury Cemetery is a one-night-only yard display. Every year on October 31, we get up early, set up the entire display, run the trick-or-treat show, shoot video and photos, and then immediately tear it all down. Crazy? Yes, absolutely, but I have always thought that it makes the display more special in that it becomes a one-time show. A quick, magically creepy sliver of time. Blink and you miss it for another year. It is a huge undertaking, but with planning and staging, the task remains manageable. And since we continue to expand every year, we have to rely on little "cheats" to get a head start on setup. One such cheat is getting the walk-in crypt set up before Halloween night. The crypt takes up my entire front porch, but can be safely and secretly completed behind a locked door, ensuring that most people, outside of my mailman, have no idea that the set up has begun. Last weekend, we were able to pull the giant crypt wall pieces into the porch to get a rough setup started. With a few tweaks and paint additions, the new version set up perfectly in the space, with room to navigate easier than last year (this is year two for this monstrous project). To most, it doesn't look like much, but to me it's a solid first step towards a finished display. The crypt walls were roughly in place, so the next step was to add a bit of lighting. A single blue bulb was added, and when I hit the switch, something clicked. It finally looked "creepy." That cold blue light dimly illuminated those walls and I felt giddy. The base of the build was there and it somehow got me excited to keep going. The shadows created outside of the barely visible blue highlights added so much depth and atmosphere! It was a bit surprising that such a small step was so important and motivating. 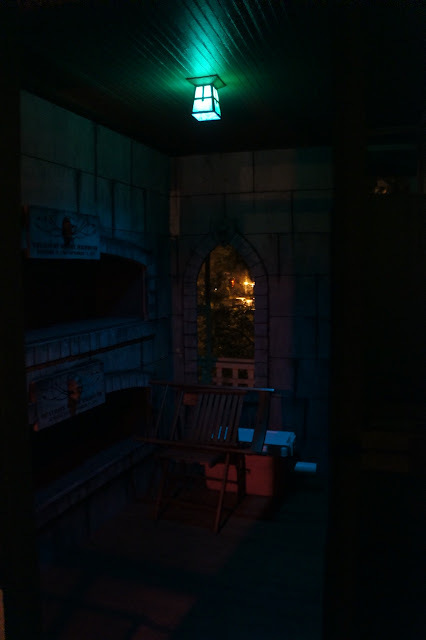 One of the notes from last year's haunt display was to adjust the too-bright lighting of the crypt, and with this simple, single bulb, the issue has been completely addressed. This will be the dull base color that will allow the spotlights and the crypt stained glass window to really pop. So after a few minutes of sitting inside the crypt to admire the lighting, I snapped back to reality and attacked the rest of my to-do list with renewed energy. Only six more days to go and I CAN NOT WAIT for the show to start! And with another check of the weather forecast, it looks a bit more promising than yesterday. What really stands out is that glorious "0% chance" of precipitation, but being that this is Ohio I already know that with six days left until the big night, this forecast can change 50 more times. I am staying cautiously optimistic in that Mother Nature has mercy on us on Halloween night and decides to keep it dry, cool and spooky! Lana Del Rey - "Once Upon A Dream"
The Neighborhood Sign Goes Up! Creation VI - "Natura Renovatur"
The Freeze - "Halloween Night"
Therradaemon - "Den Mørke Munnens Språk"